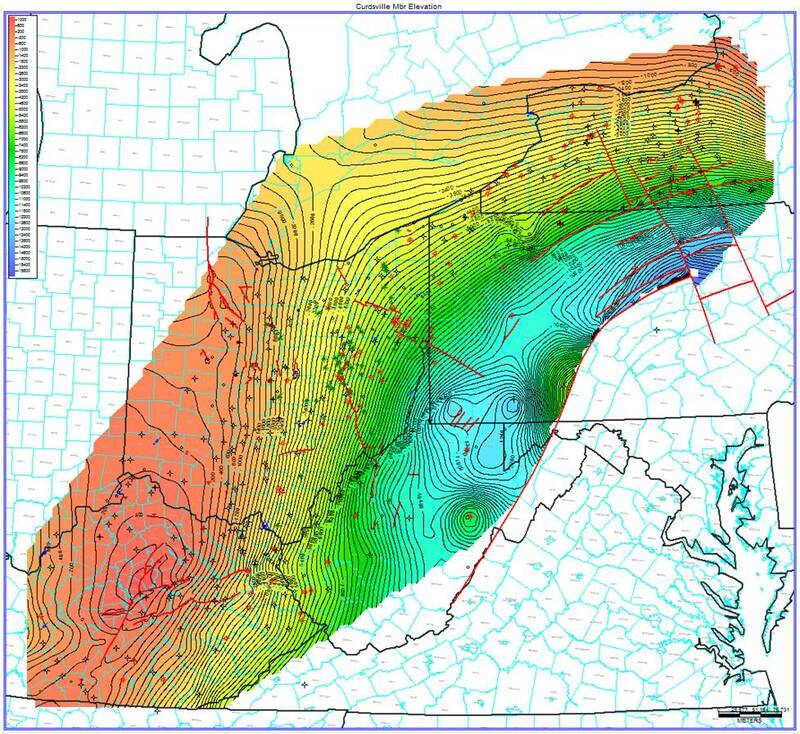 As the team lead on this task, KGS prepared well-based stratigraphic interpretations within an IHS Petra® software database system. 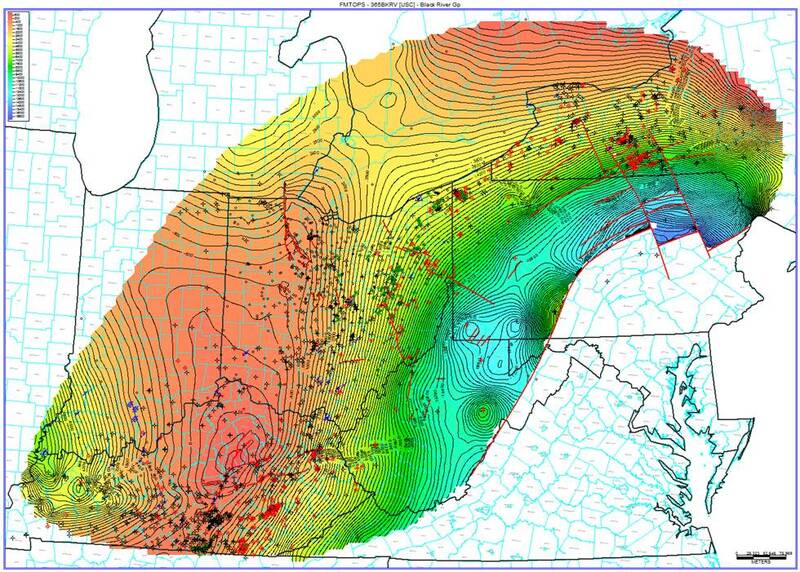 The Petra® project database contains location and header information on 10,416 wells across the five-state Study area and the bordering regions of Indiana, Michigan and southern Ontario, Canada (Figure 4-1), more than 8000 of which are Lexington/Trenton or deeper penetrations. Geophysical well logs have been loaded into the Petra® project for 1978 wells (Figure 4-2). Of these, the vast majority are from digital Log ASCII Standard (LAS) files, which have facilitated log-based correlations and calculations. Figure 4-1. 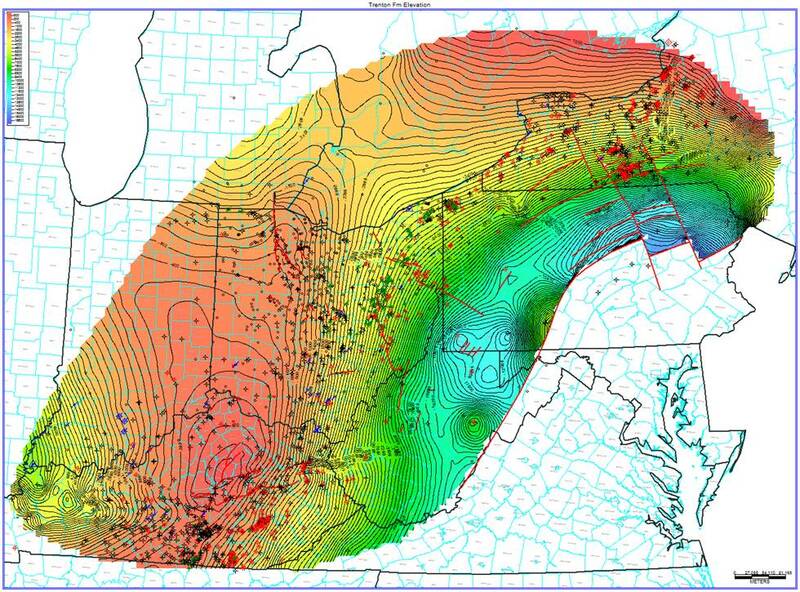 Map of 10,416 well locations consulted or otherwise utilized by the Utica Shale Play Book Study. Figure 4-2. Map of project wells in the Study area with geophysical well logs (1978) loaded into Petra® for mapping purposes. 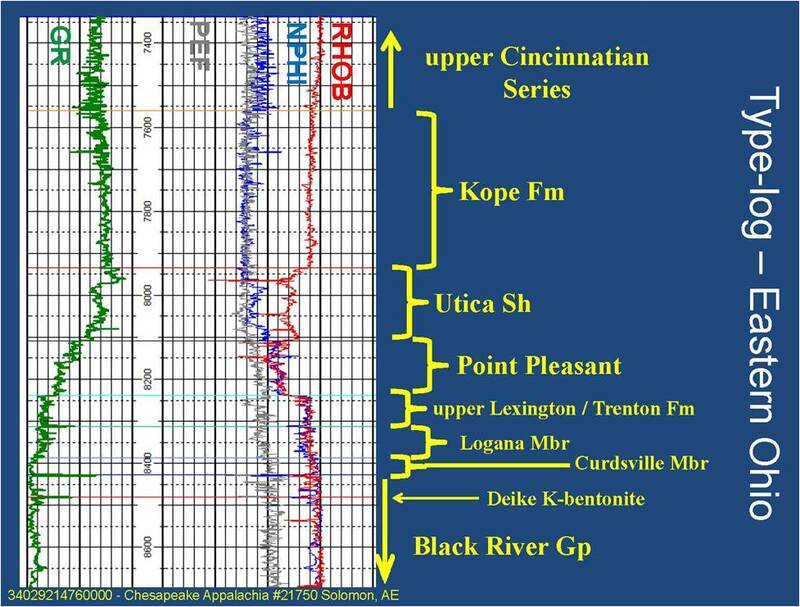 As part of this Study, KGS extended well-log-based stratigraphic interpretations for the Kope Formation, Utica Shale, Point Pleasant Formation, upper Lexington/Trenton Formation and Logana and Curdsville members of the Lexington/Trenton Formation (see Figure 3-1) established in the Trenton/Black River project (Patchen and others, 2006). 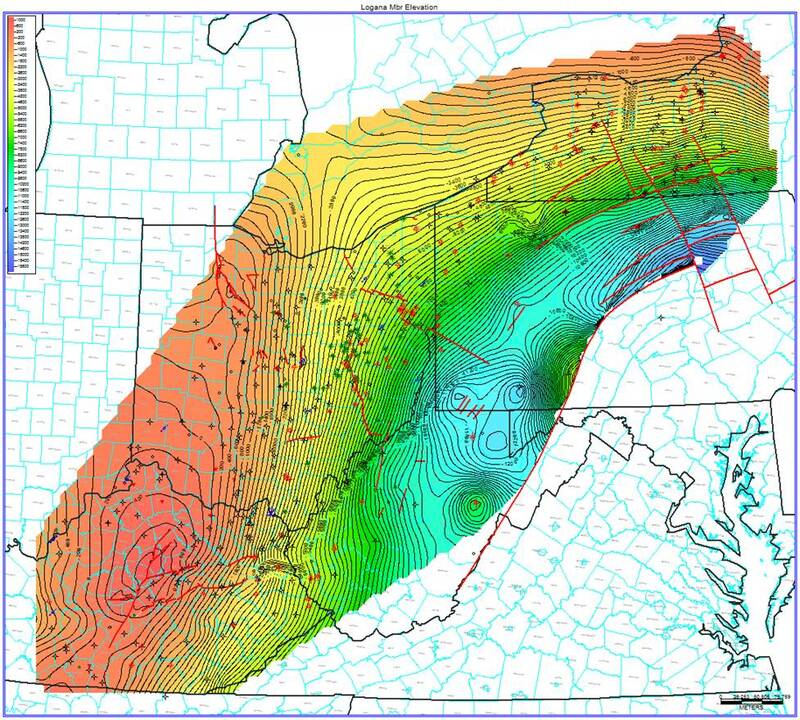 In addition, KGS researchers studied the Upper Ordovician stratigraphy on outcrops in the Maysville, Kentucky, area in order to better understand depositional and facies characteristics of the Utica and Point Pleasant formations. A type-log for the log character of the researched units is presented in Figure 4-3. The following maps (Figures 4-4 through 4-16) illustrate the results of the stratigraphic correlations for this Study, including both structure and annotated isopach maps. All structure maps display elevations in ft relative to mean sea level (MSL), with bold red lines representing major fault zones that were active in the Ordovician (Patchen and others, 2006). Figure 4-4. Structure map on top of the Kope Formation. Elevation in ft MSL with a 200-ft contour interval. Figure 4-5. 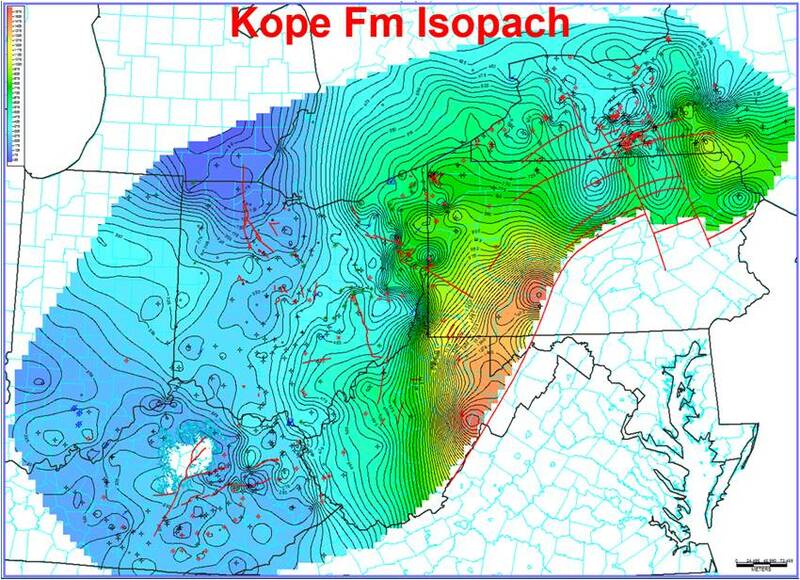 Isopach map of the Kope Formation. Thickness in ft with a 25-ft contour interval. Figure 4-6. 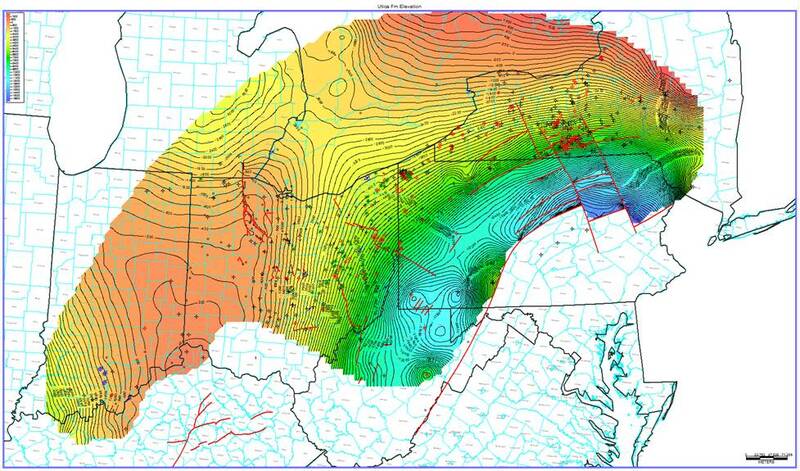 Areal extent and structure map on top of the Utica Shale. Elevation in ft MSL with a 200-ft contour interval. Figure 4-7. 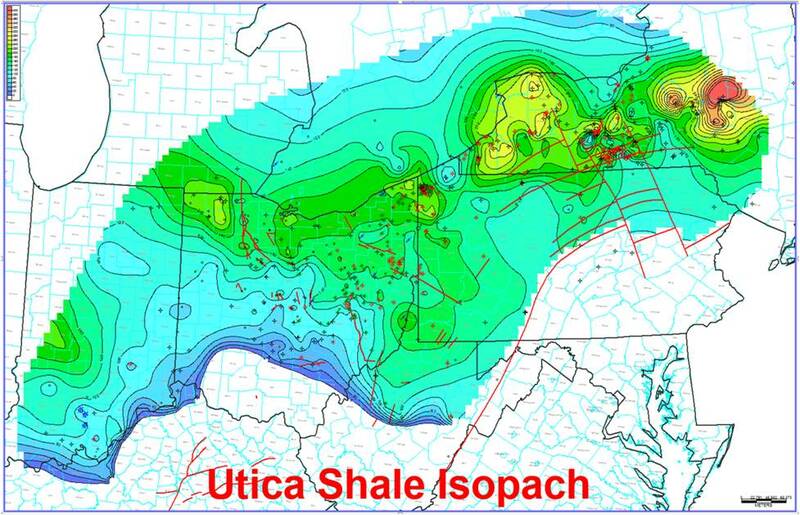 Isopach map of the Utica Shale. Thickness in ft with a 20-ft contour interval. Figure 4-8. Areal extent and structure map on top of the Point Pleasant Formation. Elevation in ft MSL with a 200-ft contour interval. Figure 4-9. 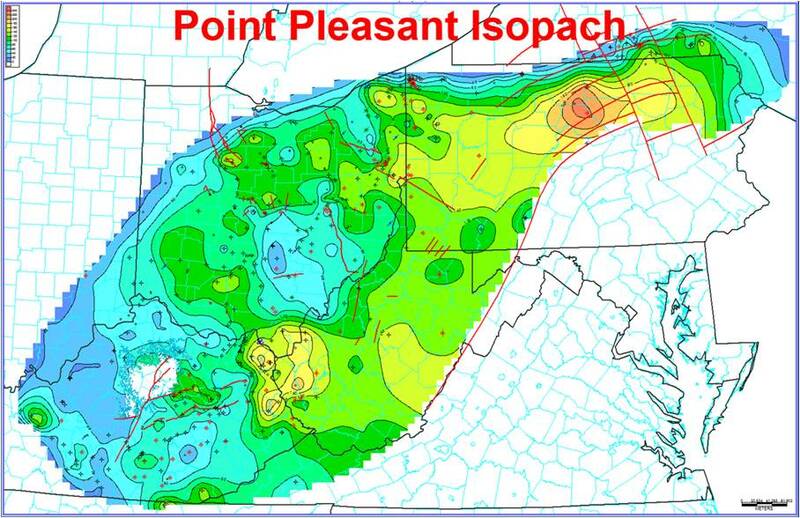 Isopach map of the Point Pleasant Formation. Thickness in ft with a 20-ft contour interval. Figure 4-10. Structure map on top of the Lexington/Trenton Formation. Elevation in ft MSL with a 200-ft contour interval. Figure 4-11. 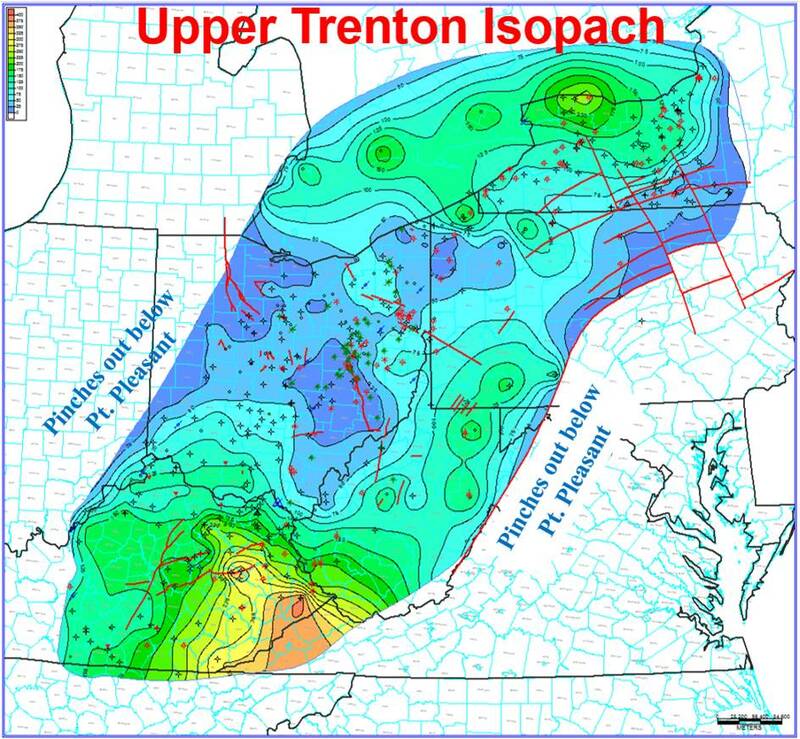 Isopach map of the upper Lexington/Trenton Formation (above the Logana Member). Thickness in ft with a 25-ft contour interval. Figure 4-12. Structure map on top of the Logana Member of the Lexington/Trenton Formation. Elevation in ft MSL with a 200-ft contour interval. Figure 4-13. 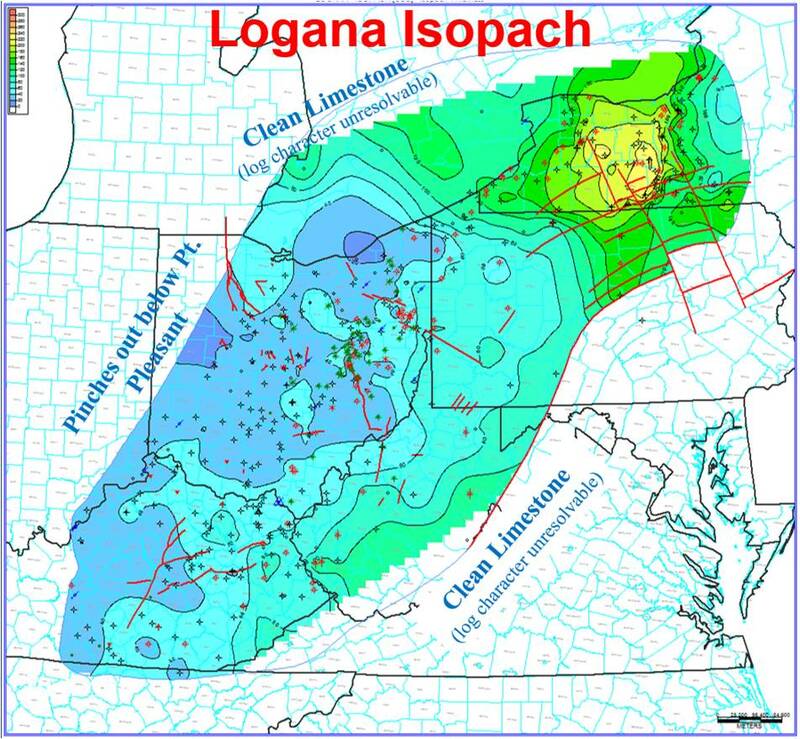 Isopach map of the Logana Member of the Lexington/Trenton Formation. Thickness in ft with a 20-ft contour interval. Figure 4-14. Structure map on top of the Curdsville Member of the Lexington/Trenton Formation. Elevation in ft MSL with a 200-ft contour interval. Figure 4-15. Isopach map of the Curdsville Member of the Lexington/Trenton Formation. Thickness in ft with a 25-ft contour interval. Figure 4-16. Structure map on top of the Middle Ordovician Black River Formation. Elevation in ft MSL with a 200-ft contour interval. 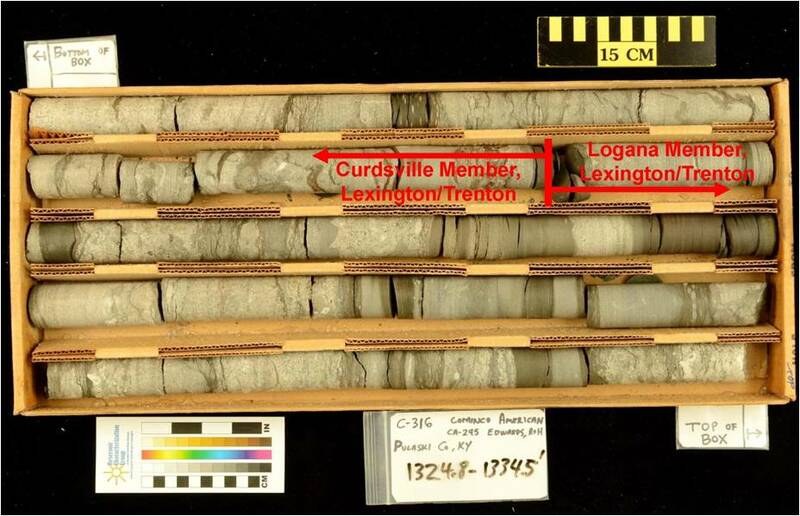 In addition to interpreting traditional stratigraphic tops from geophysical well logs, we have interpreted Upper Ordovician stratigraphy for three continuous cores from Kentucky (Figure 4-18). 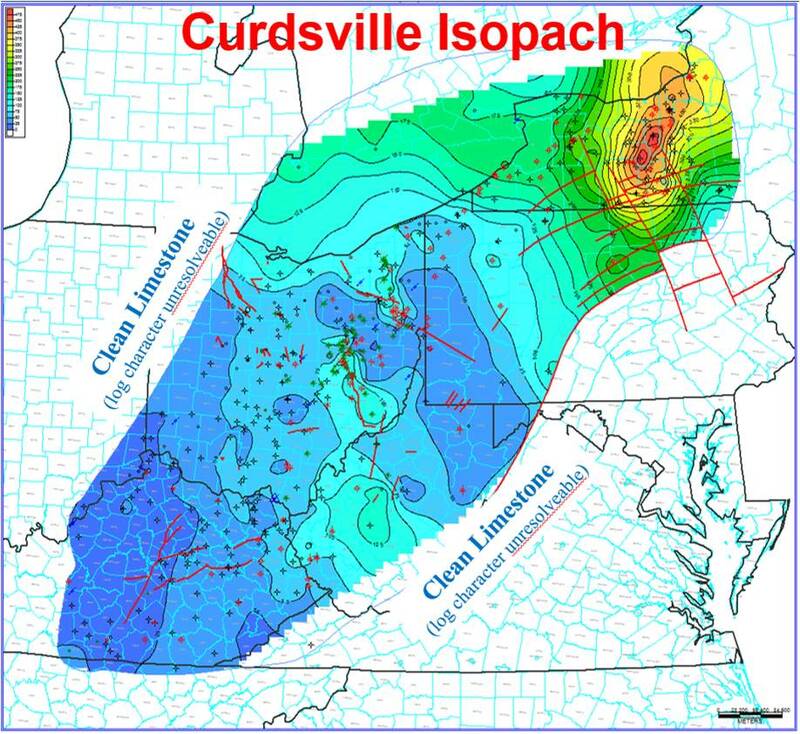 To aid in interpretation, the Upper Ordovician intervals of two of these (C-209 in Montgomery County and C-316 in Pulaski County) were photographed wet, in 10-ft intervals (Figure 4-19). Figure 4-17. 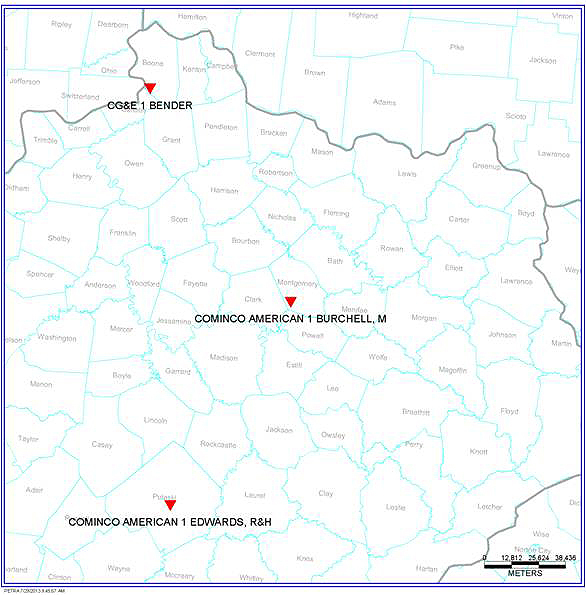 Map of the locations of three continuous cores from Kentucky that were described, photographed and sampled for stratigraphic correlation and source rock potential analysis. Figure 4-18. Photograph of the Cominco American 1 Edwards R&H core (C-316) in Pulaski County, Kentucky. 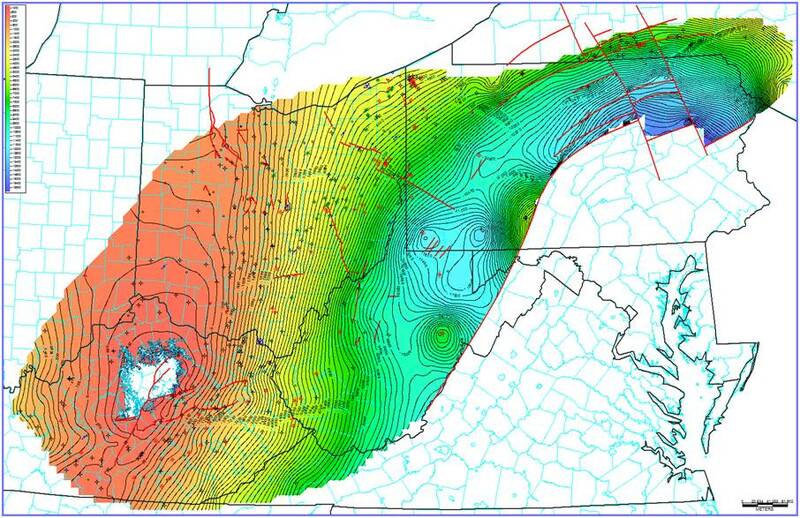 The stratigraphic break between the Logana and Curdsville members of the Lexington/Trenton Formation is shown in red. Email: Utica@geosrv.wvnet.edu | Phone: (304) 594-2331 | Website theme augmented from UBL Designs - ©2012.Response - All rights reserved.